I found an old trophy with a plate: "Laulajan lenkki 64km 1995 IIIp Miehet". Singer's Loop 40 miles 1995 3rd place men. I was able to scan two photos of me running in this race. The cross-country skiing type large front & back bib was number 14. 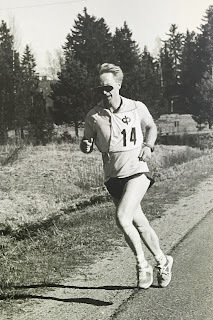 My minimalist gear included shabby shorts, worn-out shirt, huge sunglassed, white tube socks and thin-soled running shoes. My 'Flock of Seagulls' hair was blowing in the wind. That style may have been fashionable back in the day. I wondered what is the story behind this cheap trophy? Why had I kept it all these years? I've never been much of a materialist, so I tend to throw everything away. Luckily I managed to download the Finnish ultrarunning magazine 'Ultrajuoksija' 2/1995. Editor Tero Töyrylä had published a few pages about the event with interviews and results. This road race had been organized in Vammala (a former town in South-Western Finland, now a city called Sastamala) since 1990. The singer was one of the competitors: Mauno Lampimäki. He had recorded countless songs with his dance band. The start and finish was at Myllymaa sports centre. In 1995 there were thirty runners in the race, which was a big increase from previous years. 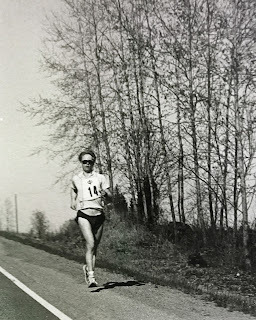 Ultrarunning was definitely booming. On Saturday, May 13th the weather was clear, cool and windy. After eight years of ironman-distance triathlons, this was my first ultrarunning race ever. In October 1994 I had ran my marathon PR 2:55. In 1995 I had increased my running mileage from 70 to 100 km/week. Two weeks before I had ran a 53km test training run with promising results. I gave it my best shot. In those days I didn't eat carbs, so there was no energy supplementation whatsoever. I may have received a cup of tap water during the race, but that's all. The course was pretty tough. My marathon split was 3:20. The route was marked, but I wasn't quite sure where to go on two occasions. In both cases I was able to confirm the right direction with someone. I finished strong in 5:04.08 in 3rd place. I don't recall feeling tired at all. Petri Orava won with 4:25.28 and Alf Granvik came second in 4:58. Maria Tähkävuori was the first woman. I was happy with my ultrarunning debut. It had been fantastic to run with legends like the Montela twins (Kalevi and Olavi) and Kalevi Saukkonen (who has run over 2100 marathons). Mauno the singer finished as well. He probably sang too, but I had to head back to Helsinki. I ran Laulajan lenkki again the next year, finishing 5th with 5:37:37, over 30 minutes slower time. I have never been able to run a faster 40-miler than on that windy Saturday in 1995.